Cecil Castellucci had already received acclaim for her first book, Boy Proof, which was named to the 2006 Best Books for Young Adults list by the Young Adult Library Services Association (YALSA), when comics came calling. In 2007 she wrote the inaugural graphic novel for DC Comics’s Minx imprint, The P.L.A.I.N. Janes, which focused on introducing new readers to the medium. Since then, she’s written several young adult novels to critical acclaim, contributed to various anthologies and has continued to dip her toe in comics with Odd Duck, the comic-novel hybrid The Year of the Beaststhe picture book, Grandma’s Gloves. Her latest novel, Moving Target: A Princess Leia Adventure was released on Force Friday. On January 26th, she reunites with Odd Duck collaborator, Sara Varon for a short story in Comics Squad: Lunch! Cecil took some time out to chat with FOG! about the story, the challenges of writing for different mediums and her current geek obsessions. FOG! : You’ve done a number of novels, including the graphic novel Odd Duck with “Worst Day Ever” artist Sara Varon. How did you and Sara start collaborating and what is your creative process like with her? 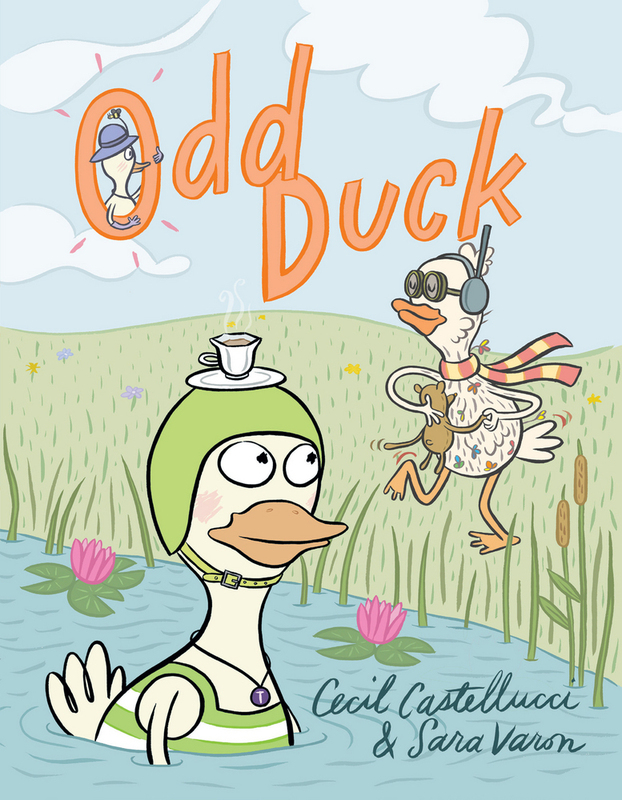 Cecil Castellucci: We got together on Odd Duck. I had sold the book to another publisher and they hired Sara to do the spot illustrations. But she’s one of my favorite comic book people so I suggested we throw out the words. Sara and I came up with Odd Duck the way it is and when that publishing company didn’t like it, we went to First Second. I love Sara, and what I love is that our process is very organic. She breaks down the text and then sends me the thumbnails. We have discussions and then she adjusts. Then we talk again and make any final tweaks. Were you a comic fan growing up and which titles and creators, if any, have influenced you and your work? Huge comic fan growing up. I have to say that Tintin was one of my first loves. I used to sleep with those books under my pillow. Also, Peanuts. Batman and Superman were big on my bookshelf. Then Asterix and The Smurfs and Lucky Luke. After a while, my brother started collecting, so I’d raid his long box. Creatively do you find writing prose or comics more challenging? What do you find most satisfactory about each medium? They both have their own unique challenges. What I love about writing comics is that I am collaborating with someone who cares about the story as much as I do. It’s like being in a band and jamming with someone and I find that very artistically fulfilling. Of course, sometimes it’s challenging to get everything that I want to in the interior life onto the page in a comic. With prose, I can write two pages of feeeeeeeeelings. But in prose I can’t have a silent moment. That’s what is the best thing about comics. Silent moments. It’s just a matter of adjusting to what medium I”m writing in. I wouldn’t call that a challenge. More like a pleasure. How did you become a part of the Comics Squad anthology? Jenni Holm asked me if maybe me and Sara would like to team up again. I love Jenni, and I loved Recess, so it was a no brainer to say yes. It was fun to come up with Pikput and Cullen. I knew I wanted to do something science-y and Sara was game. Love those amoebas! The biggest challenge was having few pages and wanting to really get their relationship as it blossoms across. Sara and I had lots of back and forth about that. I’ve got a graphic novel coming out on Dark Horse next year. And I’m writing a new YA novel. All will be revealed sooner than later! Currently I’m digging on cozy mysteries, so I’ve been obsessed with The Murdoch Mysteries, which is a Canadian show. I love how it takes place 100 years ago and tries to be as modern as it can in its way. It’s dealings with technology, science and feminism is very interesting. Also, Star Wars. I’m just about to go see it for a fourth time today! 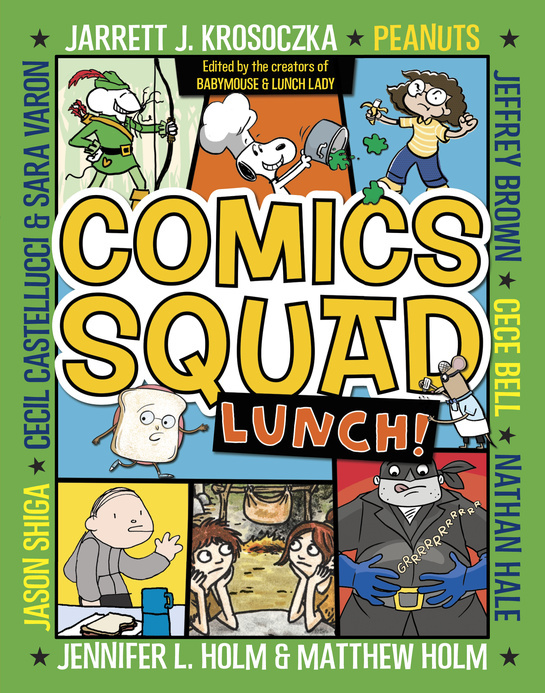 Comics Squad: Lunch! Arrives in Stores and E-tailers on January 26th!